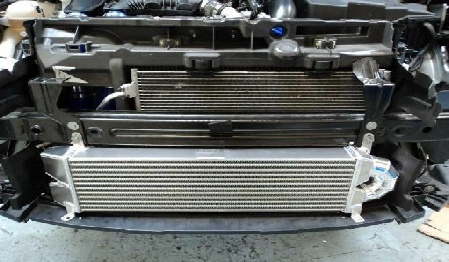 The factory fitted Citroen DS3 intercooler is very small and located at the side of the radiator. Forge have designed an intercooler to optimise the space left over by the car designers that is otherwise wasted. The core is impressive at 600mm long and 70mm thick, yet careful selection of the core design results in no additional lag compared to the small stock core. This kit is includes all the parts required, including a comprehensive set of instructions. With no cutting of the bumper required the installation time is around 4 hours for the home mechanic. This intercooler is larger than the OEM intercooler and uses a highly efficient tube and fin core design which uses up all the space that Citroen had failed to take advantage of. The core measures 600mm in length and is 70mm thick. Suitable for both DS3 and DS3 Racing.